Näyttää kaikki 49 esinettä, jotka vastaavat hakuasi. 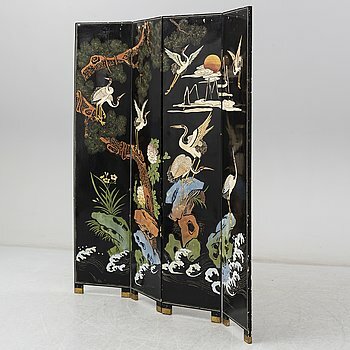 A Chinese four sided lacquered folding screen, 20th century. 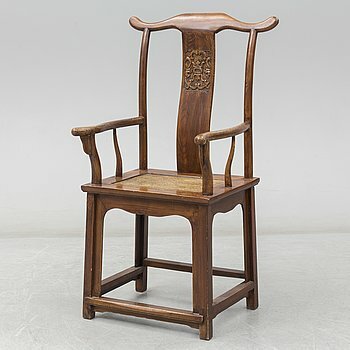 A Chinese wooden armchair, 20th century. A set of two blue and white kraak dishes and a serving dish, Ming dynasty, Wanli (1572-1620). 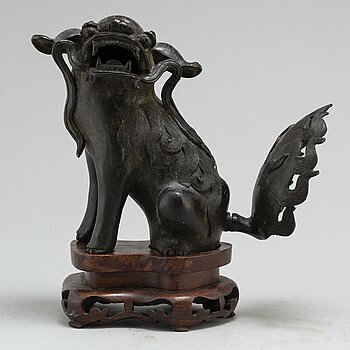 A bronze figure of a buddhist lion, Qing dynasty, 19th Century. 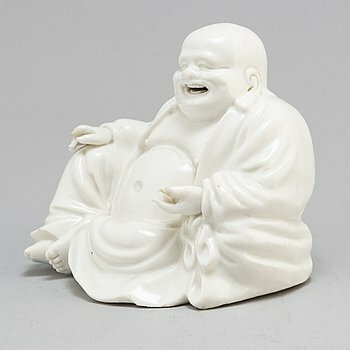 A blanc de chine figure of laughing buddha, Qing dynasty, 19th century. A large famille rose dish, Qing dynasty Qianlong (1736-95). 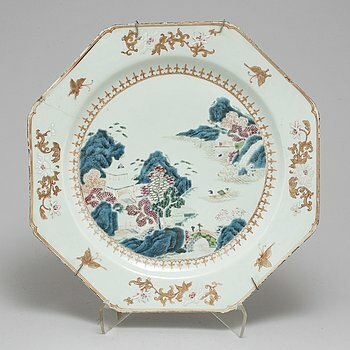 A Chinese Kangxi blue and white porcelain plate. 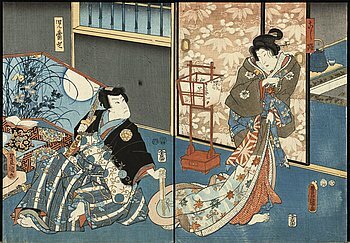 A set of four Japanese woodcut diptyks. A famille rose vase, Qing dynastin, late 19th century. An export butter dish, Qing dynasty, early 18th century. A set of four famille rose plates, Qing dynasty, Qianlong (1736-95). An album page, ink and color on paper, India, 19th Century. A Mughal album page, India, 19th Century. KULHO, Kiina 1900-luvun alkupuoli, serpentiinikivi. LATTIAMALJAKKO, posliinia, Kiina, 1900-luvun alkupuoli. A Japanese bronze vase, Meiji (1868-1912). A Japanese pottery bowl, Sumida ware, meiji (1868-1912). A famille rose dish, Qing dynasty, circa 1900. A famille rose plate, Qing dynasty Qianlong (1736-95). Two famille rose punchbowl and bowl, Qing dynasty, 18th century. VATEJA 2 KPL, posliini, Kiina 1700-luvun loppu. A pair of famille rose dishes, Qing dynasty, 19th century. Two blue and white porcelain moon flask, Qing dynasty, Guangxu (1875-1908). A blue and white export serving dish, Qing dynasty, Qianlong (1736-95). 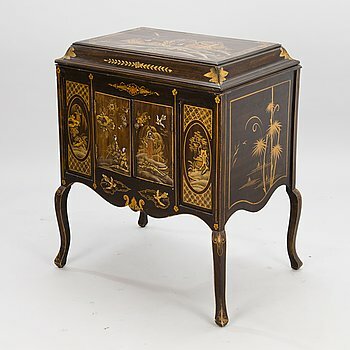 A Chinese altar cabinet, 20th century,. A pair of folding armchairs, Qing dynasty, circa 1900. A famille verte bisquit tea pot with cover, Qing dynasty, 19th Century. A pair of Chinese famille rose hat stands, 21th century. Eight famille rose export porcelain deep plates, Qing dynasty, Qianlong (1736-95). A pair of blue and white export porcelain serving dishes, Qing dynasty, Qianlong (1736-95). A pair of famille rose coffee cups with roosters, Qing dynasty, Qianlong (1736-95). Five famille rose cups with six saucers, Qing dynasty, Qianlong (1736-95). 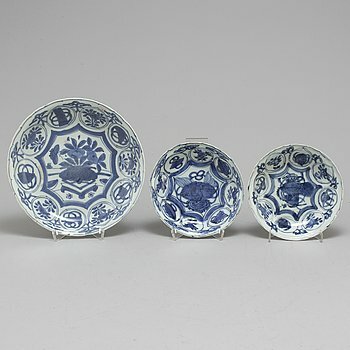 A blue and white export serving dish and three plates, Qing dynasty, Qianlong (1736-95). Two large blue and white celadon ground vases, Qing dynasty, late 19th/early 20th century. A COLLECTION OF 5 SAWANKHALOK CERAMICS VASES 1300-1500'S. 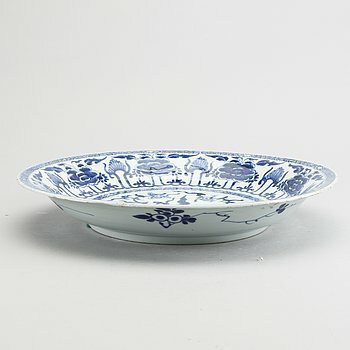 A blue and white dish, Qing dynasty, 18th Century. A famille rose wash basin, Qing dynasty, second half of the 19th century. A imari export serving dish, Qing dynasty, Qianlong (1736-95). A large blue and white export serving dish, Qing dynasty, Qianlong (1736-95). A blue and white ceramic jar, Ming dynasty. A Chinese 18th century porcelain bowl and tea pot. A set of two Chinese porcealin vases, mid 1900's. A pair vases, China, modern manufactory. Three custard cups with covers, Qing dynasty, Qianlong (1736-95). A pair of blue and white serving dishes, Qing dynasty, Qianlong (1736-95). A blue and white serving dish, Qing dynasty, Qianlong (1736-95). A pair of Japanese Meiji porcelain vases around 1900. AMITABHA BUDDHA, polttokullattua kuparimetalliseosta, Tiibet, 1800-luvun alkupuoli.